AllSeated is the world’s most innovative event planning platform. AllSeated continues to transform the event industry from paper-and-pencil to an all-digital platform by providing collaborative planning tools and seating chart software which allow venues, caterers, planners, vendors and hosts to work together on creating memorable events. Using AllSeated’s seating chart software, collaborate and organize all aspects of an event including guest list, floorplans, seating charts, and timelines quickly and efficiently. Simplicity, speed and elegance will always be our shared vision in the AllSeated family! Collaborate with your client directly within your AllSeated account. Since the key to arranging a seating chart stems from the guest list, invite your client in to build and manage their event guest list. Guest information can be easily added with the ability to group guests, keep notes, assign meal preferences and update RSVP’s. AllSeated’s guest list also allows you to track guests and run reports in real time. The guest list links directly to your seating which provides for a seamless seating arrangements process. AllSeated provide users a modern-day way of designing floorplan layouts and seating arrangements with just a click of a button. Efficiently select the various pieces of furniture and objects from the objects library and then design the floorplan to reflect the layout you wish to create. 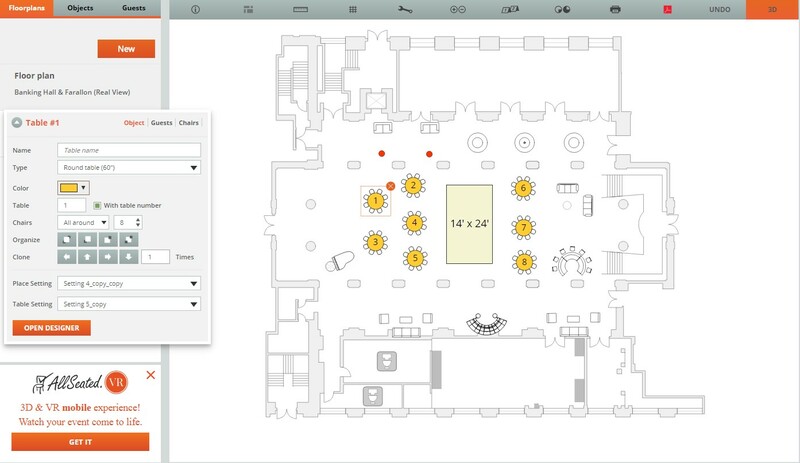 Since AllSeated’s seating chart software is a collaborative tool, work together on creating the perfect layout. All updates are made in real time and changes are super easy to make. Once RSVP’s are received, start arranging the seating chart. Conveniently seat guests directly from the guest list at the tables in the floorplan. Using the free seating chart maker tool, you can even assign guests directly to specific seats within your table seating. At any time during the process of creating the floorplan or seating chart layout,, switch from 2D viewing to 3D view in order to bring the event to life. AllSeated’s 3D feature will give a virtual walk through of an event, allowing you to visualize the layout and design of your floorplan and seating. AllSeated’s 3D view can also be set to “Bird’s Eye View” which allows you to see your floorplan layout from above. Alternatively, you can walk through the space in 3D as if you were actually moving through your event in 1st Person View. Taking a virtual walkthrough of your floorplan in 3D helps to ensure that you’re 100% satisfied with the layout before the day of your event. AllSeated is constantly developing new tools and new features specifically designed to drive business growth and ROI for our loyal user community! AllSeated has created the event market’s first, and only, truly game-changing virtual-reality capability. Using AllSeated’s Virtual Reality tool, you can now experience an event before it even happens! AllSeated’s special virtual reality goggles allow you to walk and tour the floorplan layout of an event in a realistic simulation. Learn more about AllSeated’s Virtual Reality by watching this video and the three easy steps for getting started here. With AllSeated’s VR, a venue’s property and event space can be viewed regardless of where they are in the world. AllSeated VR allows you to tour an event space in a 360 degree view anywhere, anytime allowing for a digital, life-like walkthrough of the venue. This allows clients to have the onsite experience without actually having to step foot on the property!